Is The New Kindle Kaput Before It Even Comes Out? If you listen to most of the technology press, including this publication, the new Kindle announced today is a dollar short and two years behind the technology curve. In the age of iPads who wants a dingy old Kindle? With all of that, today’s announcement [the new Kindle] just seems like a mercurial improvement, not the kind of industry re-inventing moment that the iPad launch was less than four months ago. As such, we’re disappointed. No matter what Amazon CEO Jeff Bezos says about building one device that does one thing extremely well, or how light and cheap the Kindle becomes, the fact remains that it is another device that people have to carry. This isn’t just the Kindle’s or even a misgiving of eReaders in general – all dedicated devices face this same issue eventually. Who carries around a calculator anymore? Heck, people are even starting to leave their digital cameras at home in favor of their phones – even when they travel. Convergence, mobility and raw power are what people want: and that is exactly what smartphones and tablets are giving them. Is a single use device horribly myopic? Is the Kindle an outdated gadget that needs to be sent out to pasture now that the iPad (and the soon coming slew of cheap Android tablets) are here? Absolutely not, and this is why: the more tablets, be it iPads or what have you, that are sold the better it is for Kindle. The lens that you have to view the Kindle through is just this: it is designed not for the casual reader, but the voaracious book swallower. Therefore, the idea that it will lose favor to an iPad applies nearly not at all. The most serious reader will never leave their Kindle anywhere but on their person. What about casual readers? Let them drop the Kindle reading device and head out with their iPad. In fact, I bet that nearly no casual readers own a Kindle, so let them just bring their iPad. The iPad after all is an amazing Kindle. So is that casual reader’s phone for that matter, be it Android, iOS, or any other major platform. Heck, do they really need to bring or buy an actual Kindle? If they did, they would sometimes have three Kindles on their person! Now, Amazon does not want the Kindle to be as niche as it is now, so they are improving it and cutting the price. Two good moves to get more people onto the device, but that is hardly Amazon’s full game. To compare Kindle sales and Kindle portability and Kindle anything to any other single product or even group of products is to miss the point. If you want a multi-use device, by all means get one, and then run Kindle on it. I agree with Chad, a multi-use tablet is what I want, but that has not stopped me from spending more money than I should on Amazon’s Kindle store on my iPad. To be blunt, I think that iPad is the best Kindle. I’m not even being ironic. Amazon is happiest when people buy a Kindle, it locks them into their electronic store, but there are many ways for Amazon to skin this cat. My argument only holds together if people actually use Kindle on other devices. Very well, do they? Indeed they do. Kindle is the #12 most popular free application on iPad. It’s not as popular as iBooks, but it is still performing strongly on enemy turf. When Kindle came to Android recently, my Android using friends were far more excited than I expected them to be and so forth. Think of it like this: Kindle readers are popular, so are Kindle applications on every other platform. 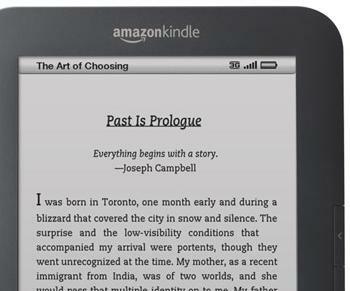 Therefore, how can Kindle lose by making simple, cheap e-readers? They get to have their cake and eat it to, being everywhere at once and only engineering a single time. Why is Kindle performing so well on the iPad and elsewhere? Kindle is the brand name for e-books, around the world. That brand means that when people buy any device, if they want to read they search for Kindle. On the iPad, the usual suspect in Kindle murder posts, Kindle is the best reading software (so I humbly think). iBooks is pretty but ponderous to use. Until iBooks gets better, it is not even the best app on the device it is designed for. Finally, if Amazon built a multi-use tablet like we all keep begging for, it would be terrible. The iPad is great, the Android tablets are going to rock, so why fight it? Amazon has no intention of losing those people, see above, but doesn’t want to make crap devices that no one uses. The Kindle device is pretty darn good, so they will continue to dominate that specific market. Apple and the other boys can slug it out on tablets, Amazon sells piles of books to their users, and everyone is happy. Why would Amazon want to fight Jobs at his own game? To sum up, and this post is running on a bit long, the more Kindles sold the better it goes for Amazon, but the company is doing damn fine on the other platforms. An iPad sold is a potential Kindle customer created, period. iPad sales are good for the Kindle platform, and Amazon should keep doing exactly what they are: building a device for their biggest fans and catering strongly to the needs of casual readers who do not want a dedicated reader.